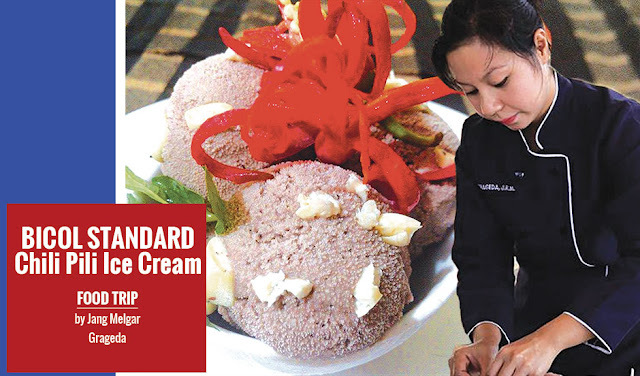 Asked to create a dessert inspired by BICOL STANDARD, local celebrity chef Jang Grageda whipped up this delightfully delectable culinary curiosity exploding with Bicolano flavors: the richness of pili nuts, the piquance of pepper, the mild creaminess of goat’s milk, and the earthy robustness of chopped tablea. Pour the goat’s milk into a heavy saucepan. Over medium heat bring the mixture to a gentle simmer (approximately 175°F) or until it begins to bubble around the edges. Add cream, stir until well blended. Pour in a bowl and allow mixture to cool. Transfer the ice cream mixture to a freezer-safe bowl or container if not already in an appropriate one. Cover tightly with plastic wrap, foil or an airtight cover. Freeze for 2 more hours and then remove from the freezer and beat again with the hand mixer. The ice cream should be thick but not too soft to scoop. If it is not thick enough, return it to the freezer for additional freezing time. Beat again before adding pili nuts. If ice cream has thickened properly, stir in the cookie chunks until well distributed throughout the ice cream. Do not beat with the hand mixer after the pili nuts have been added. Beating would break the nuts into crumbs and tiny pieces. Camalig, Albay native Jang Melgar Grageda is known for cooking up classic mouthwatering concoctions with a distinct Bicolano twist. Her often artfully plated work has been featured on television and print, including ABS-CBN’s Umagang Kay Ganda, Marhay na Aga Kapamilya, TV Patrol World, TV Patrol Bicol, GMA’s Kapuso Mo, Jessica Soho, Philippine Daily Inquirer, and Cebu Daily News. Sample her gorgeous creations at Rose G Cuisine, Camalig, Albay.